Those with limited space, or antenna restrictions, might find a small 1 meter loop antenna a solution. My son lives in an apartment. One Loop leaning against a wall gives him acceptable reception with the SDRPlay RSP on the ground floor–2nd or 3rd level flats should have very good reception. Ten meters off the ground outside should give reception equal to any SWL antenna. We all with SDRs fight the image problem. 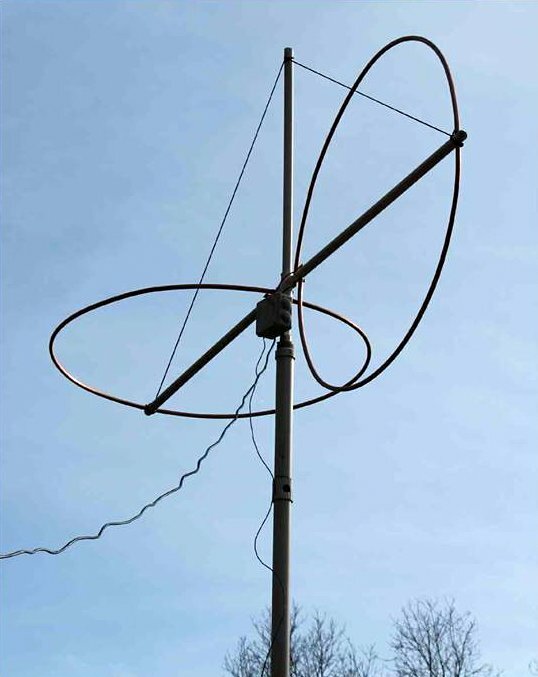 Normal resonate ham band antennas show too strong reception of unwanted bands/stations. Did I mention noise? Loops are well known for –6 db noise reduction. The LZ1AQ broad band Amp solves all these problems. http://active-antenna.eu/amplifier-kit/. My son Ted and I built three, one meter loops from soft ½ inch copper plumbing tubing. One for his apartment, two for my crossed loops antenna. We weather proofed the Copper from corrosion by coating with outdoor clear spar varnish. We shaped the circle by drawing the tubing around a round glass top patio table. The soft copper loop in held by white PCV plastic plumbing pipe. 1” or 1.25 inch schedule 40. Be careful to check that the PVC is schedule 40, thick wall. The thin wall pipe is not strong in the wind and will crack when you try to drill it. Many SDR receiver owners have seen improved noise and Image reduction by placing the plastic cased SDR unit on a small shielded/ grounded case. The Amp needs 12VDC from in the shack. The Amp has two relays that you can switch, from in the shack, to select Vertical or Horizontal loops, or a dipole. The loop amp connects back to the shack via a shielded Cat 5 cable, Make sure you get shielded CAT 5 to reduce noise pickup. 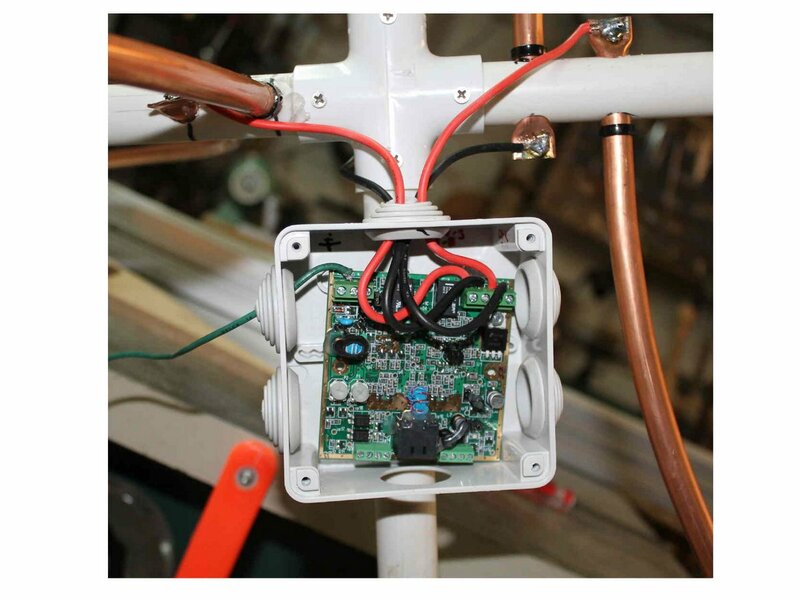 Make sure you provide an adequate good Ground below the antenna, less noise pickup and lightening protection. 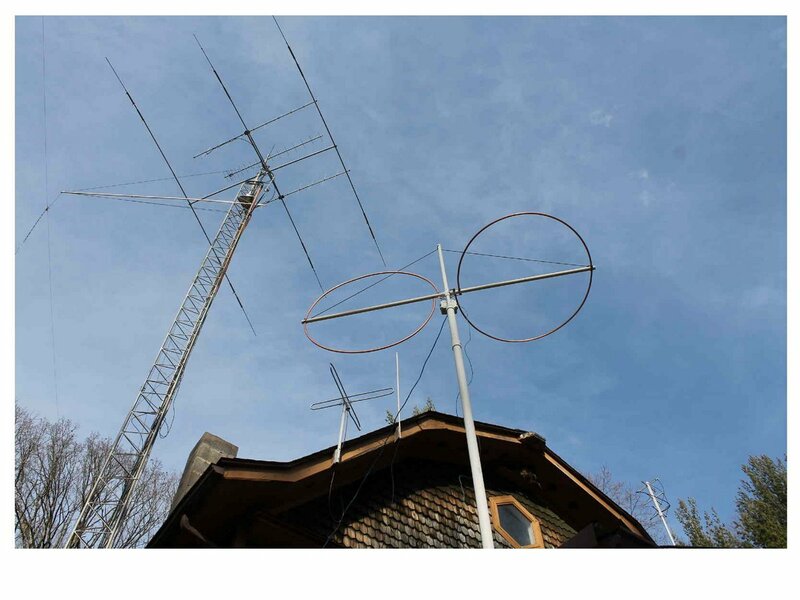 Readers: yesterday I saw Dave’s loop antenna photos on the SDRplay RSP Facebook page. I was fascinated by his horizontally/vertically oriented loops and asked if he would write up a short guest post. He kindly obliged in a matter of hours! If you have an antenna project you’d like to share, please contact me. 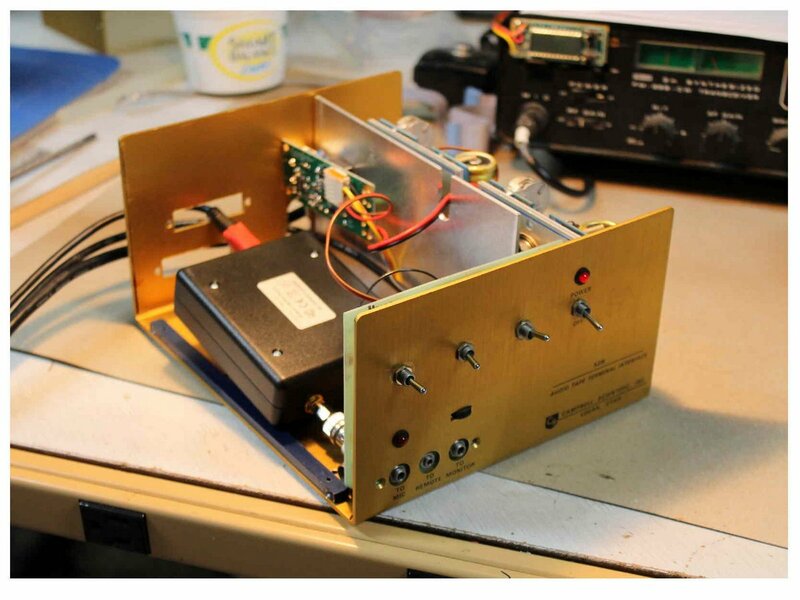 So many SWLs and ham radio operators live in areas with restrictions and pervasive RFI–projects like Dave’s can revive one’s radio life! 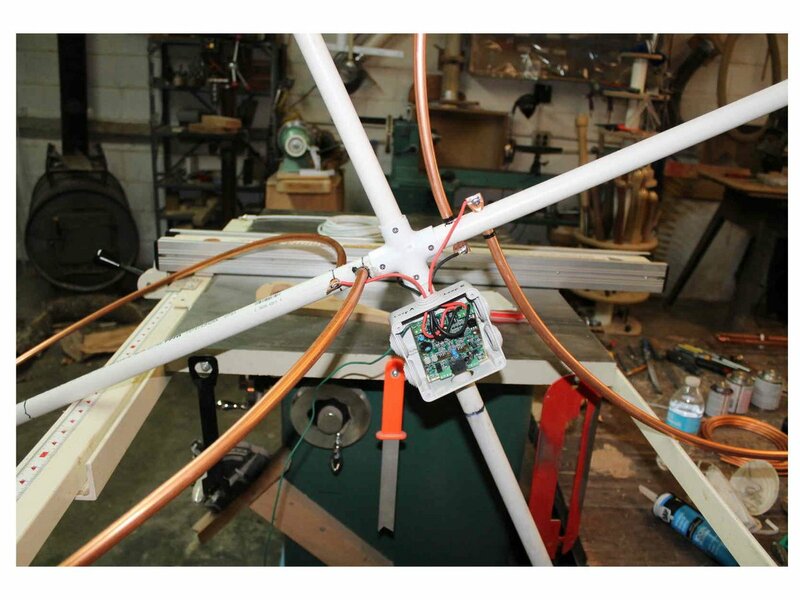 This entry was posted in Accessories, Antennas, Articles, Guest Posts, Ham Radio, How To, News, Shortwave Radio, Tutorials and tagged Antenna Projects, Antennas, Dave Gahimer (K9ZCE), Homebrew, Homebrew Mag Loop Antenna, How To, Mag Loop Antennas, Magnetic Loop Antennas on March 26, 2016 by Thomas. Just built mine. Works very well. Looks like an interesting and simple project. I’m curious if anyone has compared a loop using this amplifier with any of the commercially available receiving loops, such as the ones from Pixel or Wellbrook, as the cost in building one would be 1/4 to 1/5 the cost of one of those. Are you using the antenna with an SDRPlay? Did you limit the voltage of the control board with jumper J8 “ON” or left it in default position of “OFF” ? As a protective, weatherproofing coating spar varnish has a very limited service life. The best quality marine spar varnishes contain UV inhibitors that extend the service life of the coating. Even so the very best marine spar varnishes should be recoated at least twice twice a year if left outdoors. If not, expect the varnish to fail quickly. It will dull, dry out and eventually flake off the object to which it was applied. Spar varnish will adhere to copper. For the best adhesion I recommend sanding the copper surface well with 150 grit sandpaper first. Remove sanding residue with a tack cloth. Apply at least six coats of a quality marine spar varnish that contains the latest and greatest UV inhibitors, sanding the varnish surface with 120 grit sandpaper between coats. The UV inhibitors in spar varnish are effective only if multiple coats of varnish are applied. Plan on sanding and recoating the varnish as soon as dulling of the surface gloss is observed. There are other coatings available for outdoor use. I would suggest a quality exterior water based latex house paint for use on PVC pipe and copper. Paint should survive outdoors at least four times longer than spar varnish. There is an email address on LZ1AQ’s contact page. I also use the LZ1AQ amp with my CloudIQ SDR. I use two loops, each about 30 inches diameter. The ability to switch various combinations of loops and dipole mode really adds to the effectiveness and noise control. Highly recommended, and a fun build.